With Brock in Germany, The Sprocket invites regular guest-host Aaron Flores to cover and man the boards. You could say he’s on his way to becoming their Steve Martin. 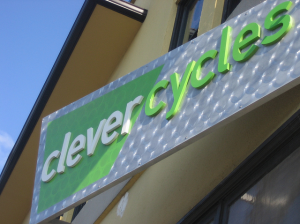 This episode’s guest is Martina Fahrner from Clever Cycles. We talk of the gender-divide within in the cycling industry (how it’s getting better and where it still needs to grow), how bicycles can be a utilitarian and not just a recreational instrument for life without a car and life with children, and we congratulate Aaron for staying sober while behind the steering wheel of the podcast.